The Denham’s hadn’t slept in days. The Black family had moved into a mostly all white neighborhood in Boston’s Dorchester section. Local hoodlums, some I probably knew, put rocks through their windows and sped by yelling racial epithets at the family as they huddled inside. A group of us decided to offer a neighborhood watch. We would cover the house while the Denham’s slept and take down license plate numbers and see if we could make any identification of those who were intent on intimidating the family. For insurance, we talked to some of our biker friends. They had access to a wide network of folk in the community who could “put the word out” that this sort of behavior would not be in their best interest. Those nights while the Denham’s slept were long and watchful. A few cars left rubber in front of the house, but there was no more harassment or violence. It became clear to us that our biker friends, along with the police, the local Roman Catholic Parish, and community leaders, had effectively sent out a warning to the troublemakers. After three nights we went home to our own beds and slept. Life will keep us alert sometimes more than we want. When a loved one is sick, or a relationship needs attention, or a child is born, close attention will be required. Yet, maybe Jesus doesn’t mean that we should be hyper- vigilant all the time. Otherwise we’d get no sleep. Maybe he’s reminding us that the holy is always trying to break through. God uses many ways to break through the clutter of our minds; sometimes a fig tree, sometimes a dandelion growing through a crack in the concrete, even as we sleep. The holy offers her gifts to us in abundance and delivers them free of charge. Only we have to sign for them. 3rd Epiphany, Year C. Doesn’t seem we get anywhere without walking in each other’s shoes. If Paul addresses the means and power of community, Jesus, quoting Isaiah, gives us our vision and mission statement. “Bring good news to the poor, sight to the blind, liberation for the oppressed and imprisoned, and a reordering of wealth and power”. It’s hard. Many of us get so far out front on issues that when we look behind there is no one there. But it all seems to fit together like a weaving when we let other strong hearts lead .Each thread: the higher vision, the gifts of the community, and the vulnerability of the priest and the community leaders, all weaving together the threads of their own beautiful and broken humanity to strive for the higher gifts. And don’t these gifts include, foremost of all, compassion for the poor and each other. It doesn’t seem we get anywhere without the ability to walk in each others shoes. An aurora borealis charged the night sky with flashes of golden light. The lights exploded and imploded, and a dark bird formed at its heart. The small dark bird grew as it swooped towards me, expanding and flicking its pinions and for an instant hovered. Immobile and transfixed I gazed into the infinite. A great wind seemed to pass and then it was still. I never told anyone about this experience. For all my life I have pondered this event, somehow unsure what spirit, if any, had visited that night. Years later, I looked closely at an icon painted by Robert Lentz. Lentz had taken up iconography and brought ancient symbols and images into the context of native life and contemporary culture. 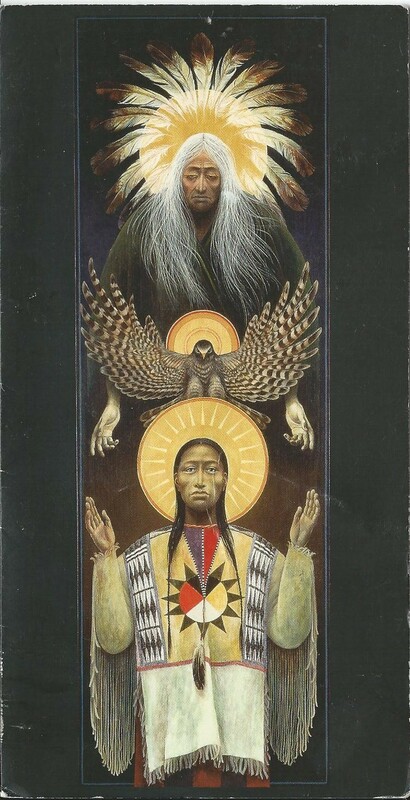 His icon of the Trinity for indigenous people depicted a wise old white-haired Father, a young and robust brave in native dress as the Son, and a dark umber falcon with gold tipped wings for the Holy Spirit. All my life I had thought that a white dove depicted the Holy Spirit. The falcon is a bird of great power that hunts with keen sight and unrelenting resolve. Lentz’s image opened the idea that the spirit that visited that night was not to be domesticated, but wild, seeking us out until we are caught in its talons and lifted up .It confirmed a childhood suspicion that the ground we walk on is holy ground and the spirit of the people whose bones lie buried here require attention and reverence. Yet it could have been a white dove. As Jesus emerged from the water and looked into the sun, all he may have seen was her dark underbelly. For me no voice from the sky accompanied the Golden flames of night to announce I was God’s beloved son. Phew! . Still, I think, I’ve heard some whispers, and sometimes I pay attention. After fifty Baptisms in three years, they started to call me “Bob the Baptist”. The Baptisms were included in the Sunday morning service. I endeavored to follow the guidelines to have Baptisms four times a year, but it wasn’t working. Baptisms became a regular part of the liturgy once a month. More to come). Our baby danced and moved in the womb during that summer before his birth. His mother invited me to place my hand on her womb as Beethoven played into the night air. These summer concerts were our city’s gift to us all. We were filled with joy for the growing life and with the expectation of things to come. Maybe she or he would be a dancer, a musician. He was born a month later with Down syndrome. Expectations were dashed and changed. We had to learn from the child a different way and pace of being; loving the child as he is. Since those days he has become a happy and a loving man, a poet and a farmer. He is an opener of new worlds to the spirit of what it means to be human. We named him Christopher-Christ bearer. Isn’t it similar for Mary and Elizabeth? Giving up many of our expectations seems to be a requirement of any who would dare to become the mothers of a child— or of God. One of those embarrassing moments took place on the road that travels the steep hill that goes from the Mount of Olives into the Kidron Valley, where the garden of Gethsemane is located. At the entrance to the road, tied to an olive tree, a donkey nibbled contentedly on a patch of grass. The thought briefly passed through my mind that I would like to ride the poor creature down the hill. The thought, mercifully, passed. Later I saw a portly American pastor riding, no bouncing, down the hill. The donkey moved quickly, probably hoping to throw his heavy charge over the side of the hill and get back to nibbling the grass. 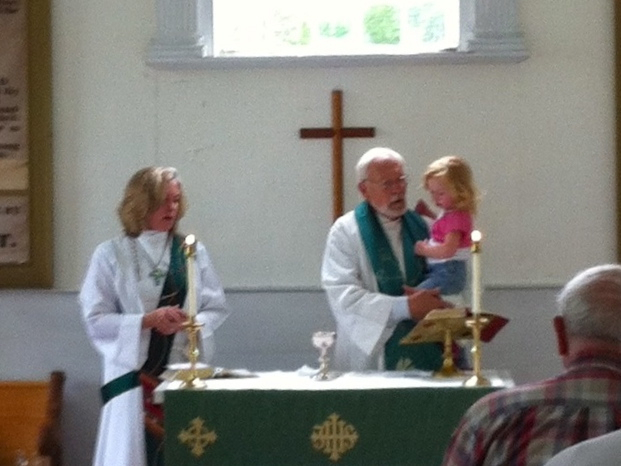 The poor pastor looked both terrified and bemused. I chuckled to myself and looked away not wishing to embarrass the man. So my warning to you is to resist the temptation of riding the donkey down the hill. If you must, ride the animal up the hill toward the city gates like Jesus, but watch out for the afternoon traffic jam. Better yet, ride a camel. A day later my dear friend, six feet two inches, 195 pounds and from Barbados, stood to his waist in the Jordan River. Two big white Southern Pentecostal clergy were on either side of him, dunking him the appointed three times backwards into the water. His face glistened in the sun, his white robe covered him, his arms outstretched— he was undoubtedly renewed. I thought, at the time, how much pure trust he had that those two Southern boys wouldn’t drown him. When the fiery Baptist announces that the “One to come will baptize with the Holy Spirit and with fire”, maybe what to him was the final judgment was for Jesus an ongoing engagement with life? Jesus turns so many ideas on their heads. Holy Spirit is a dance, a wind that blows over all the creation, the inspiration that comes unexpected and unplanned. It seems to me to participate in the feminine divine, more unconditional, more an opener of opportunities for the good rather than a critic of the bad. “Children need more models than critics”, some wise person said. At least one contemporary pilgrim could interpret such a baptism as one into a life of lightness and divine laughter. Perhaps the fire he kindles is a white heat that inspires and does not consume, like the burning bush. It is possible that Jesus came to teach us to enjoy being alive and human and to discover laughter in Holy places. My friend, the proper Scot, always dressed well for the morning liturgy. The parish, however, was made up of those who sometimes came dressed in shorts; one of the male Eucharistic ministers came in shorts and sandals in the summer. His shorts covered by an alb. Others came in jeans and polo shirts. My friend called us the worst dressed congregation in the diocese. I was glad that people showed up no matter how well or badly they were dressed and jokingly threatened to place his accreditation on our web page. To compound the conflict, my sainted English working class grandmother, had frequently complained that the more elegantly dressed women in the parish were “putting on airs”. Yet, what if we dressed in beauty, not to be seen, but to feed the holy? Every year for the last twelve a community gathers in Vermont to make offerings and prayers to the sacred. Some wear their most beautiful garments, made of fine woven textiles, colorful vests and serapes, brightly colored dresses,shirts and shawls. Many dress in garments of their indigenous people. The young are adorned in dresses or shirts that they have made with their own hands, Their shoulders are covered with a shawl or a scarf they have made from the wool of sheep kept by members of the community. A few of the young are covered with deerskin cloaks and a headdress of woven vines, leaves and feathers, often from wild turkeys. Most beautiful is the radiance of God as she shines through the wet tear stained faces as we discover sometimes for the first time and sometimes over and over, that we are in the presence of such sheer unbounded beauty. All we are doing is giving a little back from the deep well of the holy that seems to never run dry. Luke likes to place the life of Jesus and his contemporaries in historical time. My professor of Hebrew scripture, Harvey Guthrie, used to tell us that our God is a God who acts in history. My Rabbi friend says the major theme in Hebrew scripture is liberation. That theme carries forcefully through the Gospels. We have witnessed those themes of liberation in our own lifetimes: Civil Rights, Women’s liberation, Gay liberation, Mandela and Tutu in South Africa, and Havel in Czechoslovakia. IIn November of 1989 I arrived in Prague. The old city had always managed to avoid the physical ravages of war. Its old town squares and buildings, churches, palaces and bridges remained standing over a thousand years. The human toll was less evident. While there had been many signs from outside Czechoslovakia that the fervor for liberation was building: in Russia with Perestroika and Poland with the labor movement in Gdansk, The first hint of the uprising that assaulted my awareness was the music of Bob Dylan. Blaring from a record shop at the end of the bridge that led to the palace that cocooned the communist regime, Dylan’s “The Times They Are Changing” sounded confrontationally from outdoor speakers. Later, in a nightclub, a quartet sang “Blowing in the Wind’ to patrons who were largely communist party members on leave or vacation. The third was a conversation with a scientist waiting for a train to Bratislava, and as if there was too little evidence, the Berlin wall was torn down the next day. In less than a week, hundreds of thousands of Czech and Slovak citizens peacefully assembled in the old square and walked up to the statue of St Wenceslaus the streetcars clanged their bells and the people used their keys as bells to ring in the new time of liberation. Liberation is always preceded by suffering. Surely also suffering will follow, but it seems to me the movement of scripture is toward liberation. God is drawing from each moment opportunities for liberation. And since most systems, over time, tend toward some elements of oppression of the powerless and the poor, the faithful are called to be vigilant champions of justice and compassion. Still, I wonder about us here when we cannot simply externalize our oppressors because they have become so much a part of us. For when the outward oppressors do not bind us, who but our inmost oppressors keep us from rising up?